In Goa we get Marie Biscuits, but if you are in the US and have no access to it you can use Graham Crackers. If you want to make it just for adults than add a tablespoon of rum or brandy. You can skip the egg yolks and replace it with heavy cream. 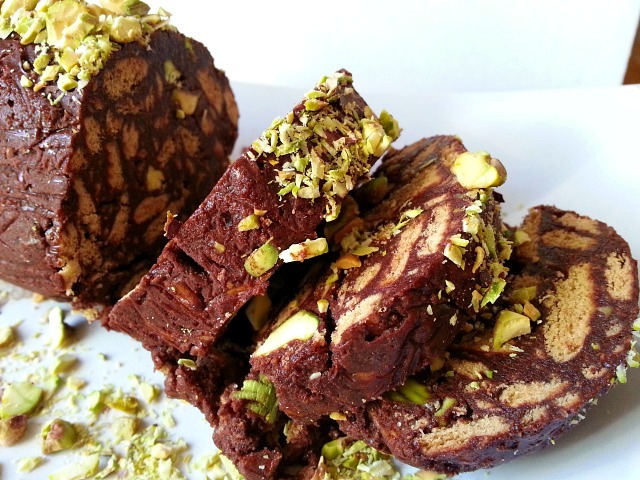 The Goan version for Salame de Chocolate (Chocolate Salami) does not use nuts but I have added pistachios. With a hand mixer blend the butter, sugar, eggs, vanilla and salt for 1 minute on slow speed. Next add the cocoa powder carefully and mix again for about 2 minutes. The frosting should look glossy. Next add the crushed biscuit, pistachios and rum/brandy and mix them together with a spatula. Transfer onto a plastic wrap to form a cylindrical shape. Tighten both ends of the plastic wrap and refrigerate for 3-4 hours till the butter hardens. Serve right away along with a hot cup of tea. Maria biscuits.. These are in pound shops in England.. I can’t believe you can’t get them in the U.S.. They are hard to find in La. I’m lucky enough to buy these from Italian and Portuguese delis.. Turrón, and sugared almonds are two Easter favourites for me..
Lucky you :-). where I live the Italian and Portuguese community are not that big so not too many specialty store. Oh.. I always thought Cali had loads of Italians there.. Not as many as New Jersey, but a sizable amount. I need to check around. 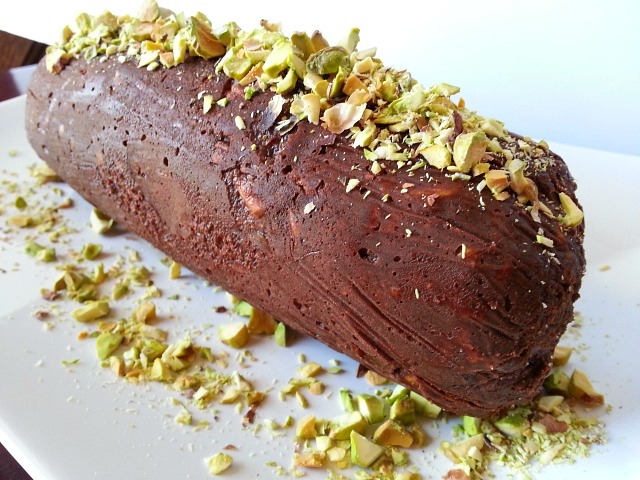 Love your Blog – that salame de chocolate looks amazing – it looks incredible – nice images ! Thank You Jason, appreciate it very much. Amazing and quite simple…Loved it, will definitely try this… 🙂 Looks yummy…!!! How delectably delicious is this.. yuM! Looking forward to trying this – perhaps I’ll ditch the ‘no sugar until Saturday’ rule that I made about two hours ago. Thank you for sharing the recipe. That looks and sounds very delicious! I honestly thought this would have salami in it – my mistake, looks like a delicious treat! Lol :-). Guess I almost got you ;-). Salame de chocolate looks phenomenal, even before We have tried it. Is this dessert made very often in Goa? I never ate this dessert in Goa. I remember the MARIE BISCUIT though. Me mum liked this biscuit very much. Everytime, I went to Goa on holiday, I used to go to Margao maket to buy Marie biscuit for mum. I wonder weather they still make this biscuits It is great to know that one of Our own comes out with the most appetising recipes. You make Us proud. You really do. Thank You Mr Stan for your kind words. 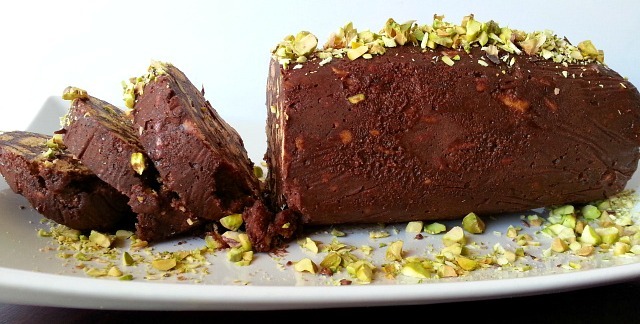 Salame de Chocolate is not made too often and not too many Goan’s make it now a days. I would say it is one dessert that is being slowly forgotten. Marie Biscuit Cake is still made in Goa but again not found too often. Guess more western influences are changing the dessert scenes in Goa. And yes you can still find Marie Biscuit in Goa :-). Lol :-). I hope you do give it a try. Oh wow! Thanks for the info Christina. It sound very much like Marie Biscuit Cake which is made in a container and the biscuits are dipped in dark black coffee. Yes, I can imagine that the coffee will just enhance it, being a coffee lover myself. Can’t wait to try them! This looks sinfully chocolate. Thanks for the recipe. Yes it is. After you eat it you got to go for a 10 mile run :-). Thank You so much Carol. And yes chocolate it is :-). Blessing to you too Carol. I would love to give this a try! When you say “fine sugar” do you mean powdered? I am sorry for the confusion. It’s fine granulated sugar as you want the crunch of the sugar when you bite into the salami slice which powder sugar does not have. Let me know how it works out when you give it a try. Wow this seems yummy! Will definitely try it! Thanks for sharing! This is very similar to a Greek dessert called Kormo which we make for Christmas too. Thank you for sharing this variation. I love the addition of pistachios. Looks and sounds good! I think this would be really good during the summer when it’s too hot to bake much. Yes Colin, as it is a no bake dessert. But be cautioned it softens easily so you want to eat it right after you take it out of the refrigerator. Kat they taste very similar to Animal cookies or Graham Crackers biscuits. You will find them at Indian or Mexican stores. If not you can substitute it with Graham Crackers. Thank You so much for the re-blog. I appreciate it very much :-). Archived ! ! This recipe is not intimidating ! ! Thanks for sharing. This is such a simple yet delicious recipe, Nandini. I am going to try this right away. 🙂 I have all the ingredients at home. 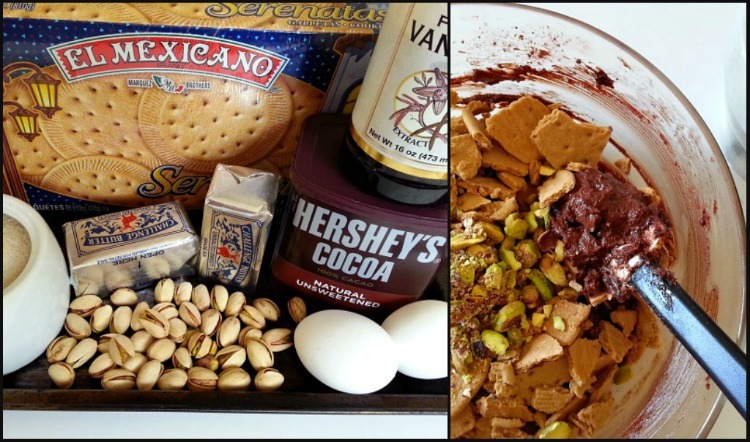 Check out this incredible offering from my pal Nandini – don’t know about y’all, but I am SO making this ASAP!